In order to understand the coinage of Alexander the Great, it is necessary first to explain the ancient Greek world. 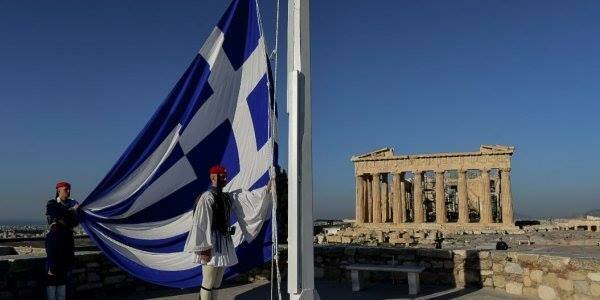 There were no specific nations and no specific country called Greece in the ancient world. Greek-speaking people had settled all over the Mediterranean. They established cities from Spain to the Black Sea in southern Russia. 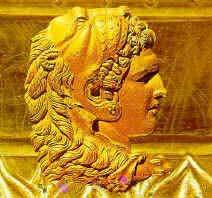 Alexander became ruler of Macedonia in 336 BC after the murder of his father Philip II. 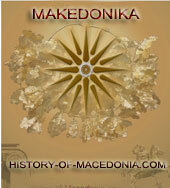 Ancient Macedonia was situated in the northeastern area of modern day Greece. 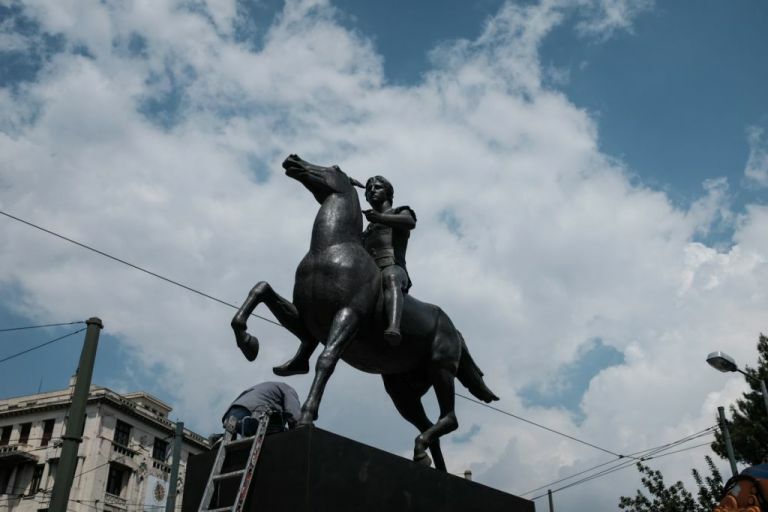 Macedonia had grown strong under Philip II. Even though Alexander was only 20, he launched a massive military expedition against the Persian Empire. The area of contention between the Persians and the Greeks was Asia Minor (modern day Turkey – the Turks had not arrived yet). Most of the coastal cites of Asia Minor were inhabitated by Greek-speaking people, but they were ruled by the Persian Empire. Alexander invaded Asia Minor to liberate the Greeks and drive out the Persians. Alexander’s armies swept down into Egypt and then circled back, taking territory the whole way to borders of India. Alexander’s armies defeated every army for 13 years. 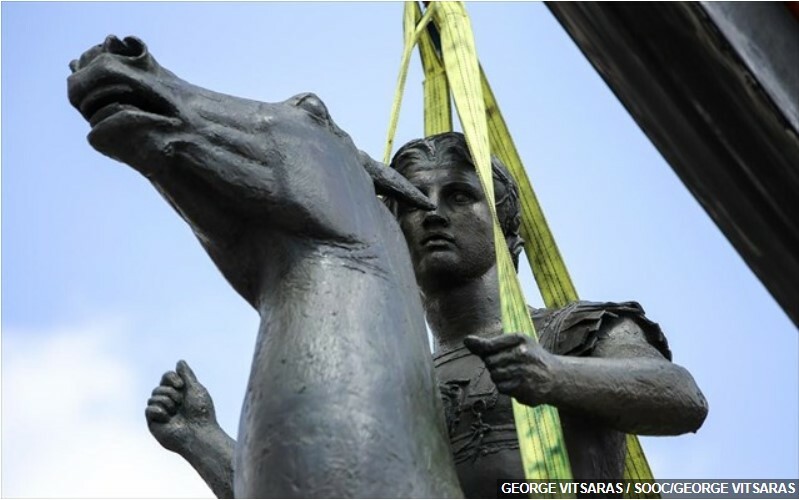 While traveling back home through Babylon, Alexander died at the age of 33 in 323 BC. The coins minted under his name from 336 to 323 BC are referred to as lifetime issues and command a high price today. After Alexander’s death, the newly established Empire was divided up among Alexander’s generals and his family. There were many kingdoms formed out this Alexandrian Empire but the three principal kingdoms were the Macedonian Kingdom, Seleucid Kingdom, and Ptolemy Kingdom. The Macedonian Kingdom covered mainland Greece, the Seleucid Kingdom was Syria to Afghanistan including parts of Asia Minor. The Ptolemy Kingdom consisted of Egypt, Israel and Lebanon. The famous Cleopatra (VII), lover of Mark Antony and Julius Caesar, came from the Ptolemy royal family. She was the last Ptolemaic ruler of Egypt. The borders of all these kingdoms changed frequently. The cities throughout this fractured empire continued to mint coins using Alexander’s name for the next 250 years. These coins are posthumous issues and naturally make up the bulk of the Alexander coins found today. 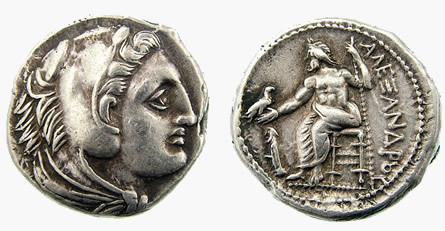 The two dominant coins of Alexander were the drachm (drachma) and the tetradrachm (tetra = 4). The drachm is about 18 mm wide and weighs about 4.2 grams of silver (size of a penny). The tetradrachm size varies according to when and where it was minted but ranges from 25-40 mm wide and weighs 17.2 grams of silver (larger than a quarter). Alexander coins were considered sound money as the receiver knew that the coin was of a certain weight of silver. The value of the coin principally came from what it was made of, not who issued the coin. The weights of the coins were regulated by city officials called magistrates. It is often their official symbols and monograms that we find on the coins. Ancient forgers used to coat copper coins with silver and try to pass them off as pure silver coins. It is not uncommon to find an ancient banker’s mark or a test cut in ancient coins. By piercing the coin, the person could tell if the silver ran through the coin. The Alexander coinage was principally used to pay soldiers, tribute (levies & taxes), and later protection money to the barbarians. It was not for the purpose of establishing the free flow of commerce. Coins were also made of gold and bronze, but we will principally deal with the silver issues here. When Alexander was alive, there were about 26 mints producing his coinage. After his death, Greek rulers and cities throughout the former Alexandrian Empire produced Alexander coinage at 52 mints at its peak. In all about 91 different mints produced Alexander coinage over the 250 years. The last Alexanders were minted at Mesembria around 65 B.C. The Alexander coin has Herakles (or Hercules as the Romans called him) on the front (obverse). On the back (reverse) was the supreme god, Zeus, who was the father of Herakles. Zeus sits on his throne holding a scepter and eagle. Although some people have argued the image of Herakles was Alexander himself, there is no convincing evidence of this and the face of Herakles is different in different regions. 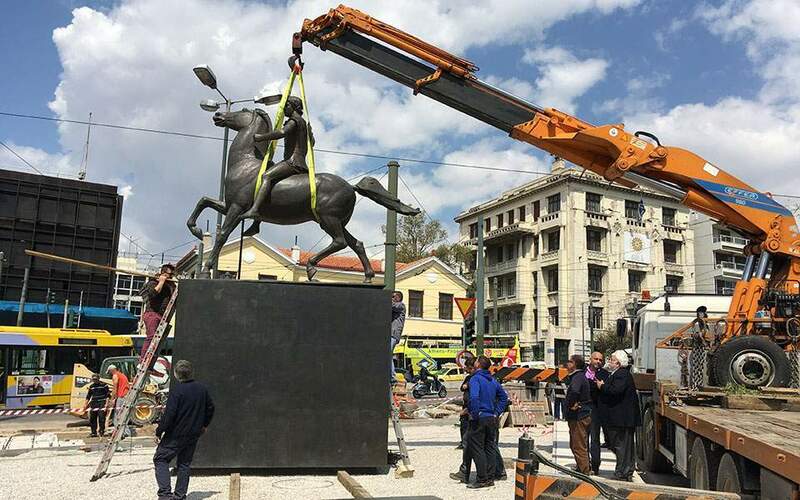 Herakles was the greatest hero of the Greeks. Born of the Greek god Zeus and made mortal, Herakles attained divine status by accomplishing 12 great tasks on Earth known as the 12 Labors of Herakles. The idea of a man becoming a god obviously was an attractive image for Alexander. The headdress that appears on the head of Herakles is the lion skin of the fierce Nemean lion that was killed by Herakles during his first labor. There are two main styles on the back (reverse). One has Zeus with his legs side by side and another style has one leg behind the other. While most lifetime issues have Zeus with his legs side by side and most posthumous issues have one leg behind the other, it is best to consult a reference book to be sure as there are exceptions. This is a posthumous issue. One leg of Zeus is behind the other) © Gorny Mosch. There are two types of inscriptions found on the reverse of Alexander coins. 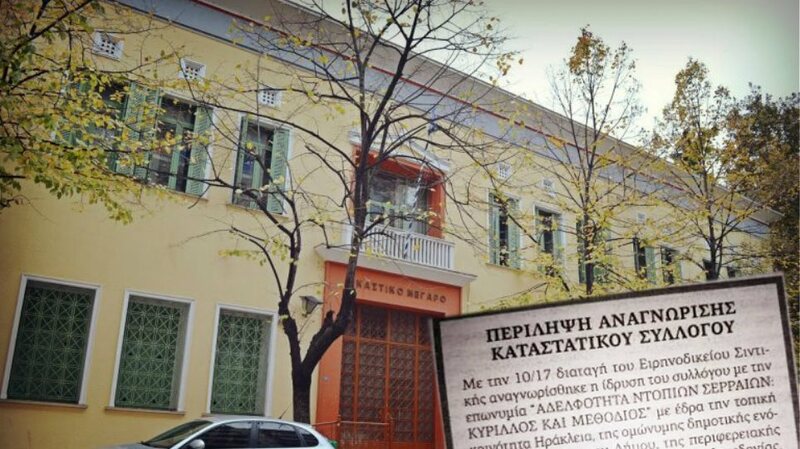 The primary inscription is ALEXANDROU (of Alexander) and ALEXANDROU BASILEWS (of Alexander the King). The “of” refers to the “coin of Alexander”. The title “King” found on certain coins varied according to region and time period. The Greek speaking people were not partial to the idea of being ruled by any king and therefore the title is not generally found on Alexander coins of mainland Greece. Today, our world timeline is based upon the traditional birth date of Jesus Christ. B.C. is Before Christ and A.D. is Latin for Anno Domino which means year of our lord. Sometimes this dating system is documented as B.C.E (Before the Common Era) and C.E (Common Era) to remove the religious terminology but the origin is the still the same. There was no uniform dating system for the ancient world. Some kingdoms later dated their coins according to when a ruler came to power (Ptolemy, Seleucid Kingdoms). Therefore, by knowing when a ruler was in power, we can date some coins. Most ancient coins, unfortunately, had no such archaic dating system on them. The Greeks, however, did place a mind numbing variety of symbols and monograms on many coins. Some monograms were abbreviations of cities or names of officals, and some still remain a mystery. Through scholarly investigation of common coin styles and a little Indiana Jones deciphering, most coins can be placed into a specific date range and assigned to a particular city or region. The Coinage In The Name Of Alexander The Great and Philip Arrhidaeus by Martin Jessop Price. This is most detailed book to date on Alexander coins. This book was published by the British Museum and the Swiss Numismatic Society in 1991. It costs between $275 to $400, if you can find a copy. I know of only two sources. The Swiss Numismatic Society and WWW.VANDERDUSSEN.COM in the Netherlands. The book documents about 4,000 Alexander coins and their variations. It should be noted that as of 2005, Martin’s Price work is 14 years old and he was not infallible in his interpretations. New evidence has come to light about Alexander coins since his work was published that would indicate he was possibly incorrect on some of his conclusions about certains mints and certain coins. Studies in the Macedonian Coinage of Alexander the Great by Hyla A. Troxell published by The American Numismatic Society, New York 1997 is the most recent Alexander coin book. Troxell follows up on the work done by Martin Price, but focusing mostly on the large Alexander Coinage issued in Alexander’s homeland of Macedonia. She presents corrections to Price’s work, revised dating of some coinages based upon her studies and coin hoards that were discovered after Martin Price’s book was published. This book should be seen as an update of Martin Price’s work with Troxell giving her own conclusions. This book is worthwhile buying and some used copies can be bought for around $40. Alexander tetradrachms range from $50 to $3,000 depending on condition, rarity and desirability. Alexander drachms range from $40 to $400. It is best to research and attribute the coin before you buy it as sellers can make mistakes in cataloging coins. The cost difference between a quality Alexander coin that is a lifetime issue versus a posthumous one can be substantial. If you don’t have the reference book, try visiting WWW.COINARCHIVES.COM. If a seller references a coin, use that reference in the search box and see what comes up. It is important to remember there are Alexanders that are genuine but may look different from the coin referenced. Martin Price in his Alexander book was not trying to document every Alexander coin but a representation mostly of coins in the British Museum. For example, for the mint of Perga, Martin Price documented 26 Alexanders in photographs and 33 Alexanders in descriptions. Hans Colin in his die study of Perga* documented 361 Alexander varieties made up of 73 different obverses and 217 reverses. If the coin is a slight variation of the referenced coin, a seller will often indicate that by using “var” after the reference. Alexander coins principally come on the market from existing collections or from newly discovered hoards. In the ancient world, there were no banks. If you had money and needed to keep it safe, you buried it. Sometimes the owner could not come back to claim it and then it sat in the ground 2,000 years until some farmer’s plough ran into it. Hoard coins go to auction houses and are mostly bought by dealers. Thanks for this explanation: it’s short and very informative !